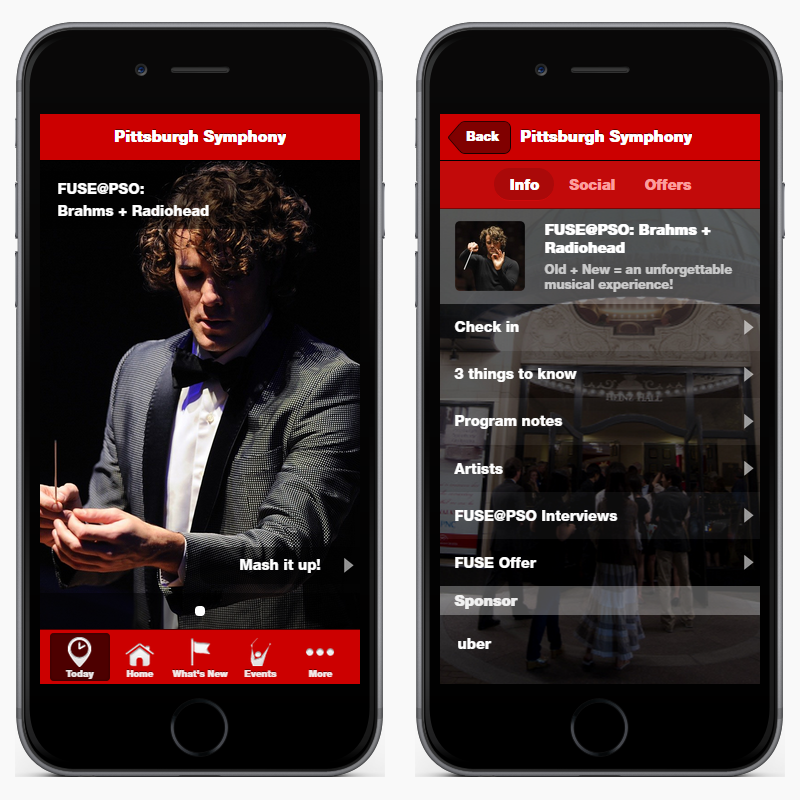 Since 1896, the Pittsburgh Symphony Orchestra has been enriching the lives of audiences with world-class music. 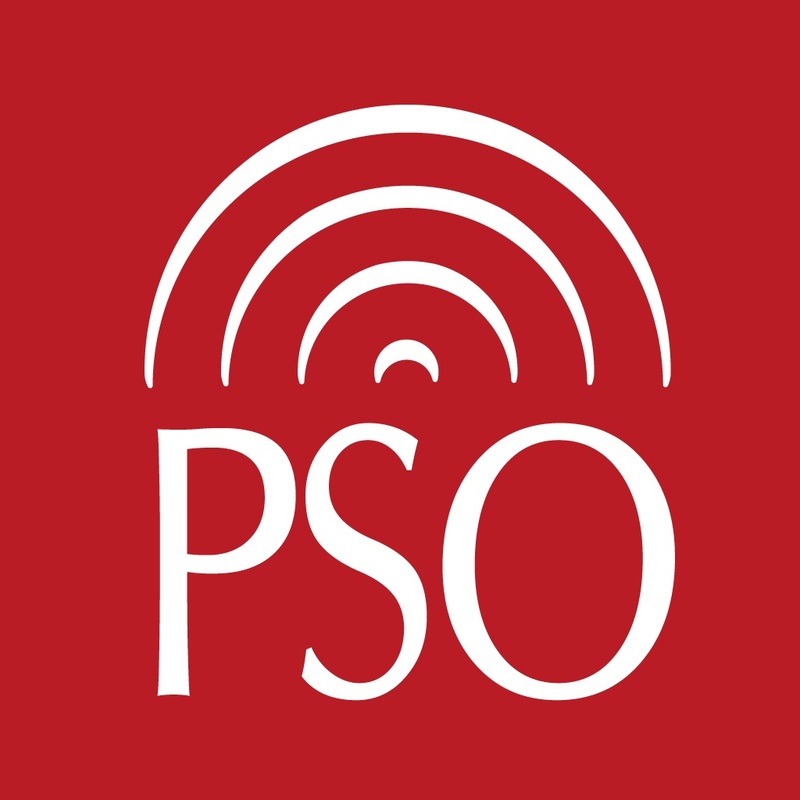 Now at the start of their 120th season, PSO expands this tradition by utilizing their mobile app’s At-The-Event feature to enhance the concert experience for the 21st Century. Their audiences now have easy access to a variety of event-specific content, social interactions with artists and patrons, and special offers. one-click access for easy editing. When setting up At-The-Event, it is important to provide as many content options as possible. You don’t want to advertise exclusive or event-specific content to your audience without providing them with an experience that lives up to its promise. Custom actions – links to other content tabs or websites. The Social feed aggregates posts from Twitter or Instagram with a defined #hashtag and adds posts made using the In-App form. The Offers area lets you showcase specific deals, promotions, and partnerships to your patrons. 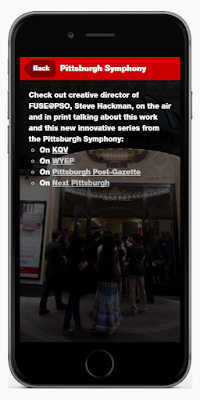 Now, lets take a look at how Pittsburgh Symphony Orchestra used each of these areas for their recent concert event – FUSE@PSO: Brahms + Radiohead. The Landing Screen for FUSE@PSO: Brahms + Radiohead on the left greets audience members with an image of the Creative Director and Conductor for the evening. The call to action “Mash it up!” is unique and relevant to the content of the performance, a mash-up of Brahms and music by Radiohead. The Info screen on the right presents Spotlight Text at the top highlighting the combination of old and new. This applies both to the combination classical and contemporary music as well as using new technology to enhance the experience of classic art forms. Following the Spotlight Text is a series of actions leading to deeper content. Let’s take a detailed look at each of them. Each “Thing to Know” is a combination of text and image intended to guide the app user toward a positive, informed experience. 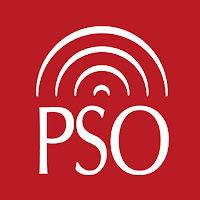 For this event, the PSO chose three Things to Know related to logistics. First, they advertise a Happy Hour which begins before the actual concert. 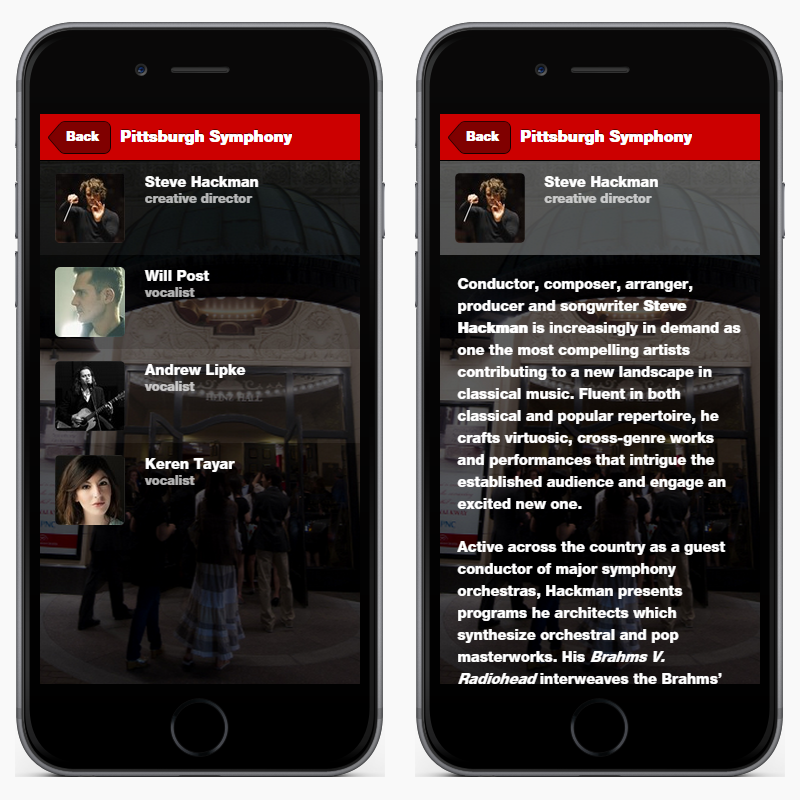 This is why it is important to have your ATE content available several hours before the actual concert starts, so that patrons can get used to the idea of relying on the App as a resource for their entire evening, not just the music itself. 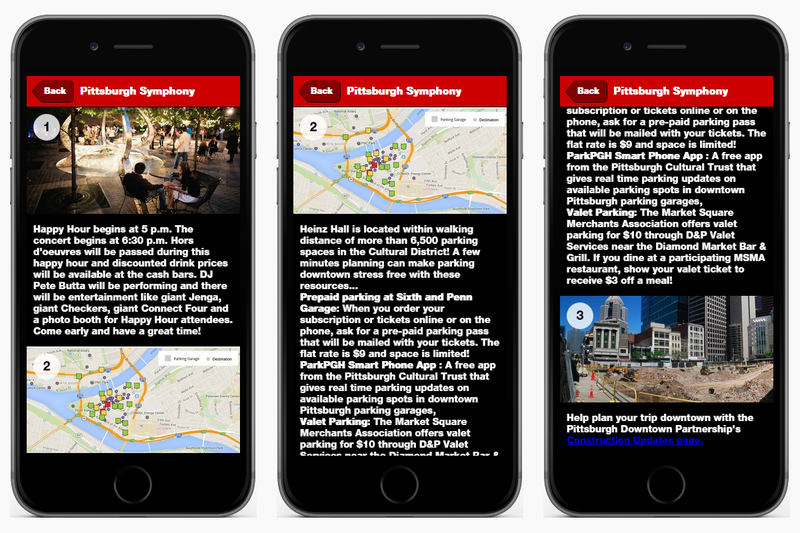 Next is Parking information, another valuable tool in helping people get to the event on time. Finally, they include a link to the city’s Construction Update page, as your preferred Maps App will not always know about various road closures. Click here for more examples of Things to Know. There are three ways that Program Notes can be added to ATE. You can link to a PDF file of the program stored in the File Storage area (under the Extras menu in the Control Panel). You can link to an external site hosting your program notes, such as issuu.com. You can include the text directly in the App, as shown above. However you wish to include them, it is an easy step to do with possible long term benefits. 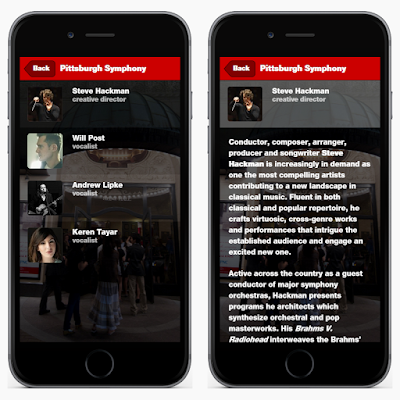 Wouldn’t it be great if your audience started reading the program on their phone instead of on paper? How much money could you save by printing 10% of the paper programs that you currently do? How many trees could you save? Its a simple feature that is good for the environment and your bottom-line. Next are the Artist Bios. Here, we see entries for the creative director and three vocalists. Tapping on one will bring up that artist’s biography. As with Program Notes, this is another great paper saver. You can also add longer bios without having to worry about how much space is being used. Having link-based Custom Actions gives you the flexibility to link to external websites, a tab within the app, or specific content items – such as Videos, Music samples, etc. Custom Actions are really the key to making each At-The-Event unique. They give audience members something special to explore and learn information about the event that isn’t in the printed program. Highlighting a sponsor on the Info screen not only adds value for the sponsor, it also provides positive advertising: something that doesn’t get in the way of the content while still being visible. 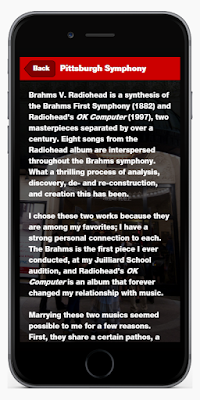 Everyone who attended the concert and viewed the Info screen saw the acknowledgement for Uber – which links to their website. 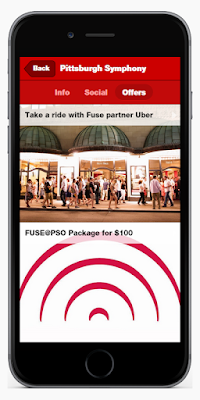 I wouldn’t be surprised if more than a few people thought of Uber when planning how to travel to and/or from the performance that night. 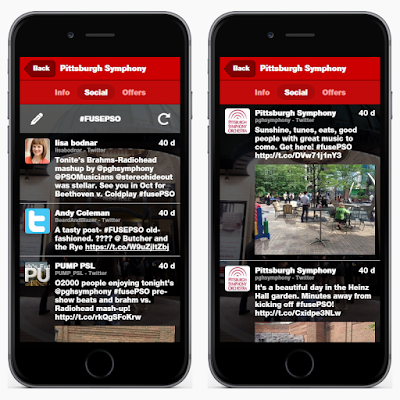 Moving away from the Info screen, next is the Social feed. 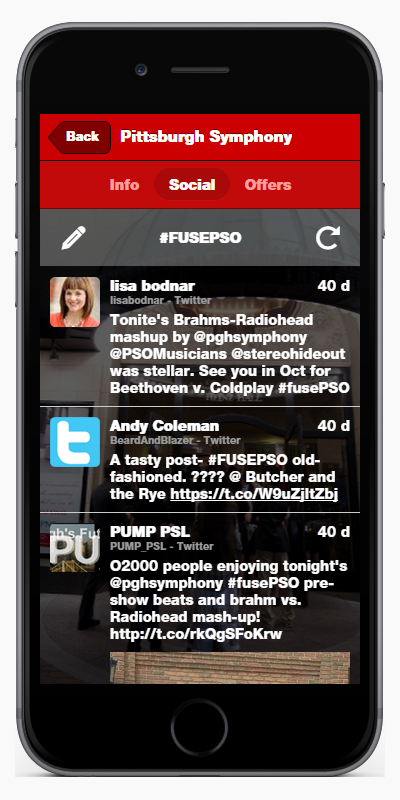 PSO used the hashtag #FUSEPSO for the evening and encouraged people to post with it. They even helped start the conversation by posting photos early on. For tips on how to encourage your audience to use the Social area of your app, click here. The Offers area is a great tool for expanding the value of the app for your patrons. Going beyond digital content and a social experience, Offers can provide your audience with access to great deals. 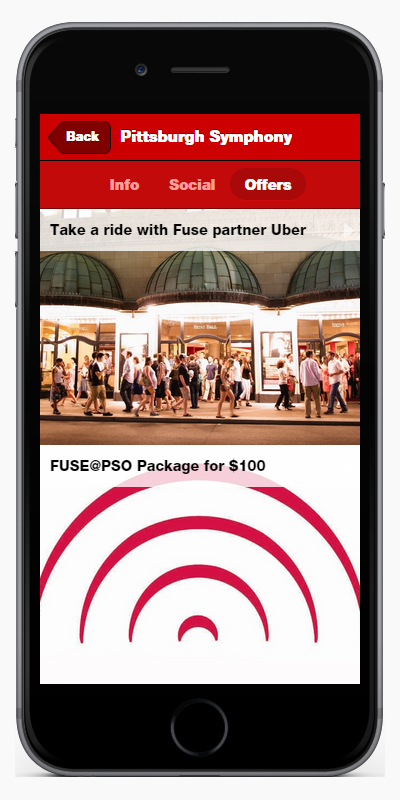 In this case, PSO offered a free ride from Uber as well as a package price for future concerts, including VIP seating and free food & drinks! What types of offers are other partners highlighting? Click here for examples. So, it is important to tell your audience that this content is available for them. Communication is 90% of the game. If people don’t know about it, they can’t use it. 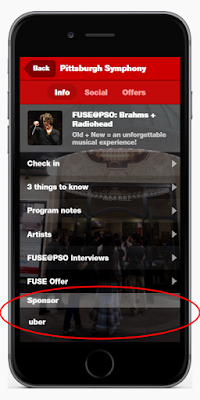 In addition to promoting the App in all of their regular communications as a vehicle to purchase tickets and learn more about concerts, the Conductor and Creative Director for that evening’s event made an announcement from the stage encouraging the audience to download or open the app to take advantage of a special package deal for the 2015-16 series of FUSE@PSO concerts. The results for June 24th speak for themselves: For this one event, they saw nearly 10x their average daily activity. You should see a spike in activity on any event day, but this is a particularly great result for a weekday night event.